Julie! LOVE. IT. 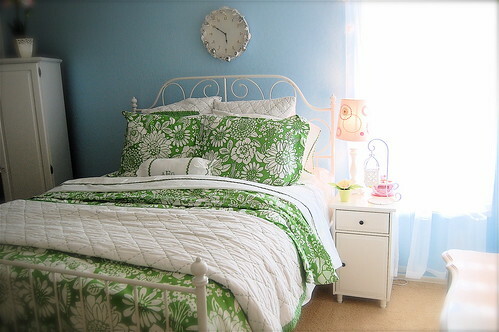 So bright and fresh- love that bedding with the blue walls! Before and after photos are my favorite. 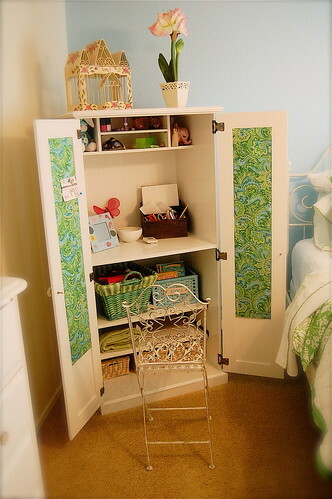 After seeing how awesome you are with girls rooms all these years, I can’t wait to see what you do with a boy room! …and apparently I need to hit up craigs list for some treasures, huh? WOW!!!! You’re amazing. I can’t even believe the transformation. I love everything about that room. Can I have one. Maybe you can come help me decorate our little baby’s room when we know what it is. 🙂 J/K You’ll be doing a lot of that yourself. But great job! Miss you. DISCUSTING! I can’t even look at it! Why does everyone in the family have to be talented but me? I still have Izzy’s name up above Ava’s crib. STRUGGLIN! I would like to know where the energy comes from and where can I get some? It is AWESOME! The energy comes in very small spirts. Mostly I am a good list maker and that’s about it. Yesterday I seriously spent most of the day sitting on the couch drooling on myself–I HEAR YOU! I don’t want to hear it about the talented part–it always seems there are mountains of projects and amazing outcomes a goin’ on at your house–which is adorable! Julie, you are amazing, where do you get all the energy? Seems you do your best work when you are PG, is that right? You should have been an interior decorator. You are so talented in so many areas. Wish my darling grandaughters would come and help me do something new with my home. When I want to feel bad about myself just visit the Elcock’s blog. Seriously, could you be more amazing>?!?! Those pictures look like they are out of a catalogue. My house is soooo boring. 🙁 I am so impressed! so cute! 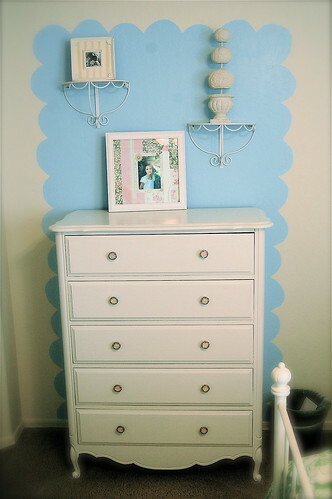 come help me with kiley’s room! seriously so adorable, you are so talented! Hi Julie, I just wanted to tell you THANK YOU for taking such good care of our house. My goodness I have never seen it so clean. That was a nice treat to come home to. I hope you guys had a nice time. I love your daughters room! I should have hired you to fix up my house while you were staying :)! I can see that your decorating genius is still going strong. You are far too humble Julie! The room looks amazing!! I was looking at past posts on your blog…did I see Amie Rae (not sure on the spelling anymore)? Love her! Congrats on the upcoming birth of baby boy #1. Your girls are going to spoil him! How exciting for you guys. Boys are lots of fun! Julie and Brian – I love your blog, you guys are so witty. 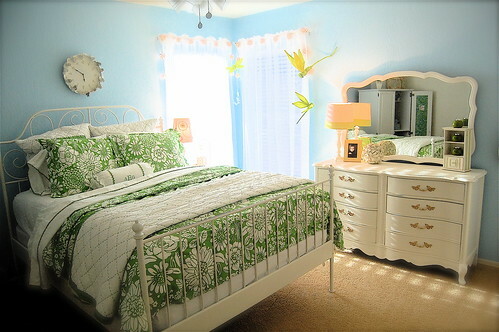 I love the bedroom and furniture, it’s amazing. What kind of paint are you using? Are you sanding prior to painting? Any tips for us wanna-be Elcocks? Congrats on the baby, can’t wait til he arrives. Previous Previous post: Where did the summer go? Next Next post: Potty Training is EXHAUSTING when you are very pregnant!